Great post! Jesus is definitely my #1 inspiration too! I can relate to what you said about your cousin. When I was younger, I had three older teenage girls who I admired and looked up to, but as they got older, they fell away from their faith and/or got involved in sinful behavior. It’s really sad because they used to all have a very strong faith—which is why I admired them. Currently, I would have to say that my mom inspires me, as well as some of my close friends. Over the summer, my mom started a Bible study and invited some of my closest friends. It’s really helped me to have a support system of fellow believers as I’ve entered into the “college-season” and I know my life would be very different without my Bible-study-buds, as well as the rest of my family and friends. It’s OK, and actually, it wasn’t my cousins, it was two girls from my church and a friend’s older sister. Sorry if I wasn’t clear before. And lol, I’m definitely blessed with the support system. You should totally start one—I mean, you want to be a pastor so it would be good practice! Gr8 post, Julian! Jesus and my wife inspire me also. Every once in awhile my wife angers me 😁 but never Jesus! 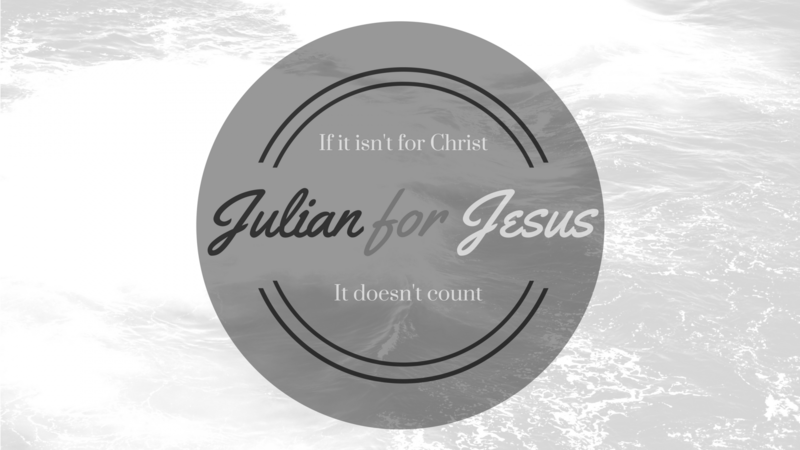 Your faith is inspiring Julian! You have given me a boost this morning and I feel blessed by your blog. I’m thankful for your mother’s love and support as it has enabled you to lead others to Christ. Keep it up brother, let your light shine, for too many in this world are caught in the darkness. I will pray for James. Woah! truly it is an honor to have been uplifting to you brother. I pray all is well with you. This here is God telling me that I am right on track as all I seek to do is strengthen the christian community. Thanks a lot brother for your comment. How is everything anyway? Life is good. I’m unbelievably busy at work and have more personal things to do than I have time. Busy is good and I am blessed to have a great job, health, family, and friend (including social media friends). I just need to find more bible time, it’s been lacking for the last few months. Stay strong. Previous Previous post: 30 day blog challenge day 28: Something/Someone I miss.